Despite being slightly more expensive than the lower level Coolmax Performance 250 and 500 options, the 800 variety with an 8cm thick layer of memory foam is the best selling mattress from the Coolmax Performance range. As you might have guessed, the figure in the title indicates the foam thickness in these mattresses although most still have a total thickness of 20cm with the remainder being made up of reflex foam which is firmer, more resilient and provides great support. As a result the mattresses with thinner foam have a slightly firmer feel while the Coolmax Performance 800 has a medium support rating and is super comfortable. In the past, many people found that their memory foam mattresses were overheating as the material tends to retain a low of body heat. This made for an uncomfortable night’s sleep but with the recent introduction of temperature regulating fabrics such as the highly rated Coolmax variety, this is no longer a problem. Coolmax really is a remarkable material that keeps you at an optimum temperature by responding to heat fluctuations. The Coolmax cover is also removable and can be machine washed or replaced over time. 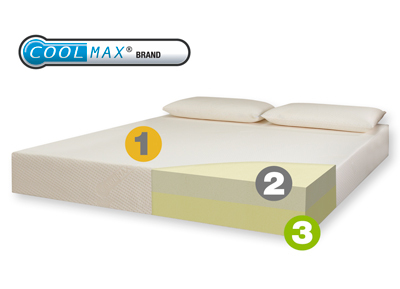 The memory foam used in Coolmax Performance 800 has a density of 50kg/m³ which is consistent with other mattresses in this price range, however it falls short of the high density foam used by top brands such as Tempur. Sold by the Memory Foam Warehouse, one of the leading UK retailers, the Coolmax Performance 800 is available in a total of six sizes from single up to a super king size including small double and Euro. It’s currently available at a bargain discounted price in Memory Foam Warehouse’s summer sale so don’t delay. Manufacturer: CoolMax, Memory Foam Warehouse. 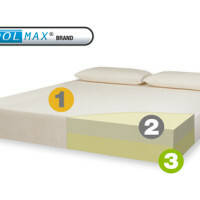 Type: Hypoallergenic, Memory Foam, Reflex Foam, Medium. Be the first to review “Coolmax Performance 800 Memory Foam Mattress Reviews” Click here to cancel reply.